Sustrans Volunteers help to look after the 14,000+ miles of Sustrans' National Cycle Network which covers the UK. 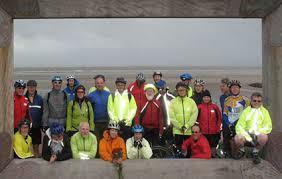 They work together in regional or local teams to help ensure that routes on their patch remain well signed, report any problems to relevant bodies and generally, get involved in a range of activities which help to maintain and improve local cycle routes. If you have some time to spare each month and are interested in supporting Sustrans and the National Cycle Network, take a look at http://www.sustrans.org.uk/volunteer/get-involved/vacancies for more information. ← Legging it from London!